Most Catholic countries have a strong history in markets and Austria is no exception. Vienna always had a large number of markets where local farmers could sell goods and fresh vegetables, fruits, poultry, veal and dairy products were on offer. Today, Vienna still has several markets of this kind - however, now they are enriched by falafels, Thai spices and exotic fruits from all over the World. By far the biggest market of Vienna is the Naschmarkt, which stretches away from the Karlsplatz Square. It starts just behind the Secession and ends at the Kettenbrückengasse subway station - on Saturdays, however, a flea market takes place and extends the Naschmarkt even further. At the onset of the Naschmarkt you can also see the unassuming "Theater an der Wien" theatre. Now an opera again, it used to be a musical theatre for many years and still fights for its reputation as an opera. It has a longstanding history in this field, though: This is the theatre where Mozart′s "Zauberflöte" ("The Magic Fluit") was first performed in collaboration with Emmanuel Schikaneder. The Naschmarkt is one of the very few parts of Vienna where you can get a feeling for the ten thousands (actually hundred of thousand) foreigners that live here: The goods for sale come from a wide range of countries with something like an emphasis on South-Eastern European, Middle Eastern and Far Eastern food. This does not mean that the traditional goods of Austria are not sold anymore. Tourists love to stroll over the market - presumably because markets of this kind have less of a tradition in Great Britain or the US; you will find almost no Italian or Asian tourists on the Naschmarkt, despite of plenty of them in Vienna at any time of the year. The Naschmarkt is also a great place for a stop-over for lunch. Tourists also come to see two of Otto Wagner′s most important Jugenstil (Art Nouveau) buildings at Linke Wienzeile 38 and 40. Both buildings were erected in 1899. The left building is covered in majolica tiles, thus the German name "Majolikahaus". Despite of not being very popular with Ringstraßen-loving Viennese at its days, it is now among Wagner′s most famous contributions to Vienna′s architectural heritage. If you want to take pictures, come in the morning when it is in the sunlight. Some history of the Naschmarkt: Originally, this site was occupied by a disposal site for ashes and manure. Thus one of the theories why the name might be derived from "ash"; alternatively, it could also be due to the sale of sweets such as dates or crystallised fruit. To me it was amusing to discover that "nasch" has found its way into American English as a noun, probably via Yiddish. Anyway, the ash disposal site was supplemented with a small dairy market in 1780, when this market had to be closed at the Freyung between the current BA-CA Kunstforum Wien and the Schottenstift Abbey due to some argument with the monks. 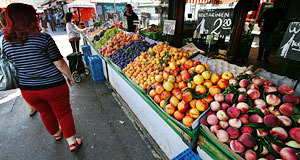 In 1793, a law was released that made it compulsory to sell all vegetables and fruits brought to Vienna with carriages to be sold on the Naschmarkt. Fruits and vegetables brought by boat or ship were sold on a different market. So the market prospered and grew. Around 1900, the river Wien was covered and canalised. The space created that way became now officially called "Naschmarkt" in 1905. The architect in charge was Otto Wagner. This was planned to be a provisory solution only: There were plans to build a pompous boulevard connecting the Staatsoper / Hofburg area with Schloss Schönbrunn not dissimilar to the Ringstraße. Thanks to WWI and the end of the empire, this plan failed and the Naschmarkt with its now approximately 170 market stalls can still take place unharmed.